We love sharing the fun! Pools are available exclusively at our Eastside location. Both our indoor pool and outdoor pool are available to rent. 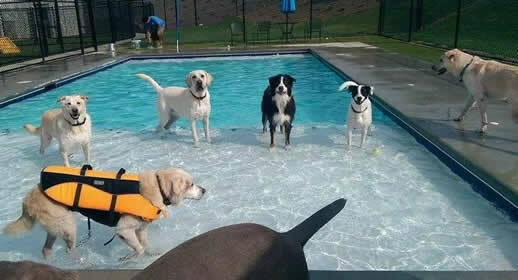 All pool guests must complete full enrollment forms as well as provide proof of dhpp, bordetella and rabies. Email us to request enrollment forms ahead of time or you can complete them at the time of your first rental. Pool rental spots can be reserved far in advance or same day just with a phone call. The indoor pool is heated and is available year round during normal business hours. It is an 8 x 14 saltwater pool. Life jackets are available to borrow. The outdoor pool is available for rent before 10:30 a.m. and after 3:00 p.m. during the open summer season. 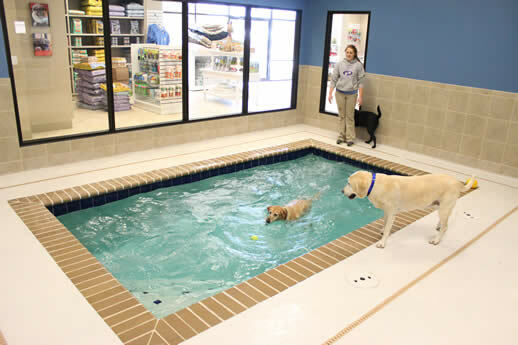 It is a large 18 x 36 saltwater pool with an especially large shallow end so that even the smallest of dogs can enjoy splash time. Life jackets are available to borrow. *Memberships can only be used for dogs in the same household. 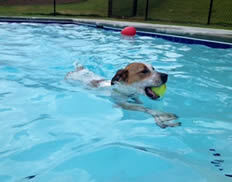 Swimming is not only a great way for dogs to have fun but it's also an excellent way for them to get wondeful physical exercise. The added resistant that the water provides actually makes swimming much more of an intense workout than just walking and running provides. It is also great for dogs with arthritis and/or joint problems. 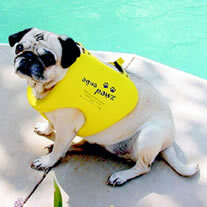 We highly recommend using a lifejacket for your dog. 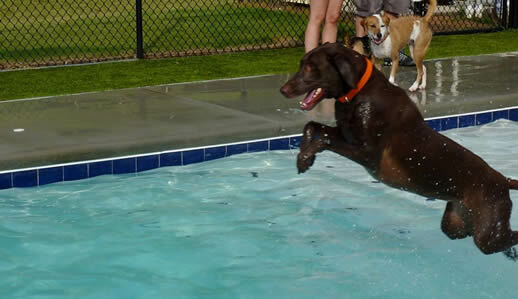 This gives owners (and their pet) a little more peace of mind for safety while their pet is having a fun pool time. Life jackets can be rented for both our heated indoor pool and our outdoor pool. We have lots of great pets available for adoption!